KETCHIKAN, ALASKA - A rare find in Alaska of a green sea turtle was discovered Sunday, December 2nd by Mary Hert, a resident of Gravina Island, on the beach near her residence. Hert contacted the NOAA Office for Enforcement in regards to this rare find. NOAA Office for Enforcement Special Agent Drew Mathews recovered the deceased sea turtle Monday and transported it to Ketchikan to be held until it is shipped to Hawaii for a necropsy. 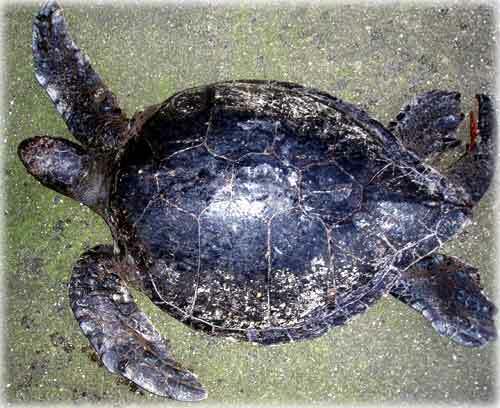 This is the third dead sea turtle found in the Ketchikan area since 1997. Green sea turtles live in tropical to subtropical waters and eat sea grass along with other plant life. They can stand water temperatures as low as 46 degrees, but when water temperatures become lower than that their body quits functioning. According to Mathews, all sea turtles are protected species.